Engineers Without Borders is completely student run, with ongoing projects in Kenya and Guatemala. Students and faculty from the UW College of Engineering and Applied Science share the recipe for an outstanding education. The University of Wyoming College of Engineering and Applied Science (CEAS) offers an exceptional undergraduate education, featuring hands-on learning and research, caring and accomplished faculty, an active campus life and affordability. To capitalize on this success, expanded excellence in undergraduate education became a pillar of the Tier-1 Engineering Initiative underway at UW (click here to learn more about the initiative). Here, UW’s current and former students share what excellence means to them. Long recognized for its excellent value, CEAS added Undergraduate Excellence Scholarships to attract more top students, including those from out of state. These merit-based scholarships include $6,000 a year renewable for four years—for a total of $24,000. In the first two years of the program, 48 scholarships will be awarded annually, with the number increasing from there. The scholars program already attracts top students such as Bethany Orrick of Forney, Texas, who planned on attending college in Texas before receiving the scholarship. “I got a letter from CEAS that changed everything,” she says. “Within a couple days I had arranged a flight and was off to visit the campus. Orrick, who entered UW in fall 2014, plans to major in both architectural engineering and environment and natural resources. “I hope to develop sustainable structures in the future,” she says. Steve Barrett, CEAS associate dean for academic programs, says that the scholars program is just one of many potential scholarships for incoming students, including approximately $500,000 available through endowments and a new program that adds to the Trustees’ Scholars Award with funding for a computer and travel. For many, the accessible and caring faculty set UW apart. “One of the best parts of UW is the faculty because the professors here are so devoted to not only teaching us but oftentimes mentoring us,” says Anita Khannikova of Kazakhstan, who received her bachelor’s from UW in petroleum engineering with honors and is now pursuing her master’s here. “In the summer of 2013, I got involved in undergraduate research,” James says. “My senior design project was developing a target tracking vision system for mobile robots.” James is continuing that research as a graduate student, hoping the target tracking and 3-D vision can help create robots to assist with remote physical therapy. He works with the mobile ad-hoc networking research group, which also helps recruit future students by presenting at Discovery Days and to high school students. Corporate partnerships create new opportunities for UW students as well, such as the Encana Integrated Simulation Data Center, where students work in teams and have direct access to industry software; the Hess Digital Rock Physics Laboratory; and the new WPX Drilling Simulator Teaching Lab. “We’re excited to work more closely with industry, whether it’s internships or seminars,” Bagley adds. There are more than 250 recognized student organizations at UW, and CEAS is home to more than two dozen professional societies and engineering organizations. “I encourage every first-year student I see to participate in them,” Bagley says, adding that they offer great networking and professional development. Kimble participated in several student societies, as well as studying urban resilience in disaster-prone areas abroad at the University of Iceland. “UW offers so many different and fantastic opportunities for the students—I dare say there is something for everyone,” she says. Another facet of the Tier-1 Engineering Initiative is a focus on K–14 partnerships, which fosters a pipeline for future engineers. “I think it’s really clear that you’ve got to get kids interested in science, math and engineering when they’re younger, especially if you’re trying to improve the diversity of your student body,” Bagley says. “A lot of the K–14 initiatives we’re working on involve visiting younger grades to show them what engineers and computer scientists do, and how fun it is,” Barrett says. Students in the engineering societies help with these projects, including demonstrations in their hometown schools. Bagley says female role models such as Lamia Goual, associate professor for the School of Energy Resources, will also help attract more women to the field. As new students enter CEAS, they can expect a solid foundation. “Because of the experience I had in class, I was able to start working immediately,” Kimble says. 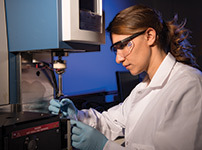 Petroleum engineering student Anita Khannikova performs research in Associate Professor Vladimir Alvarado's lab. Three UW students share their thoughts on helping young women learn about STEM fields.